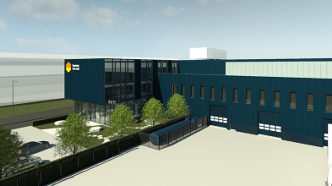 At the end of 2018 we will move to a new production facility with office building in GreenPark Aalsmeer. The building will be sustainable and responsible and is equipped with the necessary modern facilities for our automated work process. As a dedicated partner for crop science companies, breeders, professional growers and investors, we help innovators innovate at Bosman Van Zaal. We create the solutions and systems needed to make our partners successful, from food to cosmetics, from pharmacy to medicine. Whether it concerns cash facilities in Poland or Rwanda or the design of integrated software systems in America or Australia. The combination of design and realization of all horticultural disciplines within one company ensures that we experience healthy growth. That is why Bosman Van Zaal is building a new production facility with office space. 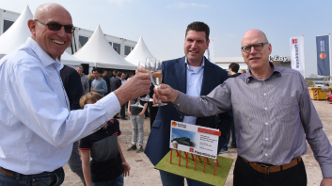 The new location, with its 16,266 m² of BVO, will accommodate more than 230 employees, who are still housed at our locations in De Kwakel and Aalsmeer. Heembouw concluded the turnkey agreement in the autumn of 2017. Habeon Architecten made the design. The building will be completed in December 2018. The design and appearance of the building fits in with our core values: robust, inventive, high-quality and open. The steel blue color of the facade is according to our identity and we work with the materials steel and aluminum. The internal layout of the office is efficient and flexible and is fully in line with the streamlined production process of the production area. The main entrance has a special, eye-catching honeycomb construction of white steel, which refers to our logo. This honeycomb beam, which is over 5.5 metres high, 44 metres long and 35.8 tonnes heavy, was installed by Voortman Steel Construction on Tuesday 29 May. 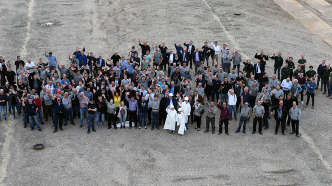 Bosman Van Zaal and Habeon Architects have put a great deal of effort into the GPR Construction method (energy, environment, health, quality of use and future value), resulting in a score of 8.5. To achieve this, the building includes a heat pump connected to a WCO source system, LED lighting (presence detection) in the office and hall, HR++ triple glazing, CO2 control in accommodation rooms, solar panels and is a gas-free business premises. In addition to the sustainable and robust design of the new premises, we are also working on optimising the experience on the shop floor. Among other things, we are creating a work and dining bar, a training centre, using sit-stand desks and an open office layout, and we are continuing to improve our automation process thanks to the use of high-tech machines. We also install a demo area in which we present some of our products to our (potential) customers. For current updates, please keep an eye on our Facebook page or contact us. March 16, 2018 The Grow & Roll vertical farming system developed by Bosman Van Zaal reduces the cultivation period from six to two weeks. 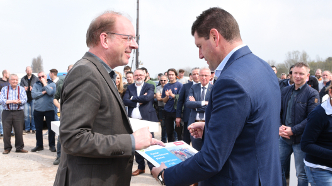 November 6, 2018 Bosman Van Zaal in Top 20 of prestigious award Best Employer in horticulture for young professionals 2018.